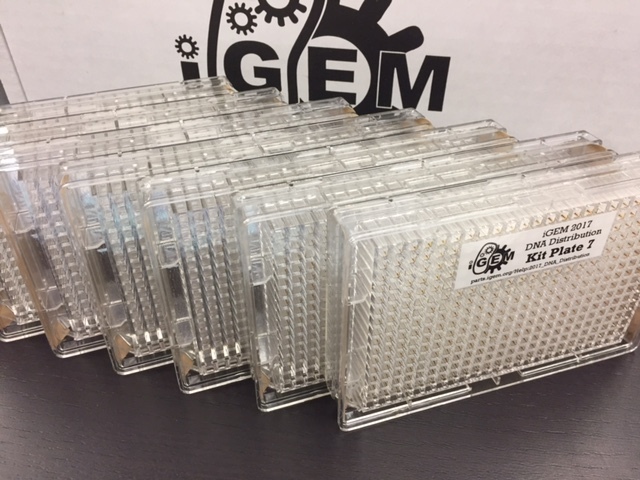 The iGEM 2017 DNA Distribution contains over 2000 high-quality part samples as dried plasmid DNA. Each sample is QC tested through sequencing and AB test plates. While there is not enough DNA for 3A Assembly right out of the kit, you can transform a part into competent cells and make your own glycerol stock for future use. Freeze Indicator included in some Distribution Kits. If your kit was frozen at some point, the indicator would turn purple. Note: Some Distribution Kits were shipped with a Freeze Indicator. If you received your kit, and the freeze indicator was purple (instead of clear), then at some point during shipment your kit was frozen. Your Measurement Kit (the LUDOX specifically) is no longer usable, but you can request a new one from us. link contains parts in a variety of Registry standard plasmid backbones (pSB1C3, pSB1A3, pSB3K3, etc). Registry standard backbones paired with BBa_J04450. selected parts from 2015 submissions: sequence-confirmed and ends-confirmed parts in pSB1C3. 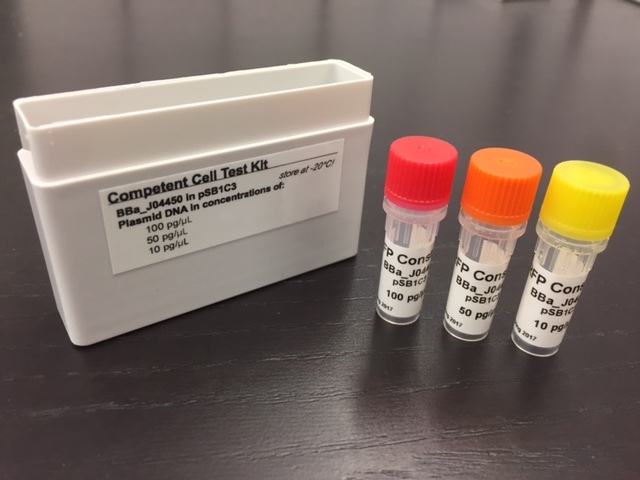 Storage: The Competent Cell Test Kit should be stored at -20°C, for longer term storage. 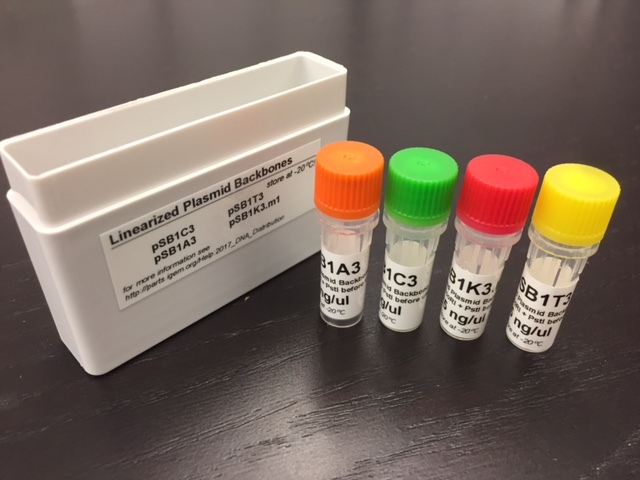 The 2017 Distribution Kit includes a set of four linearized plasmid backbones: pSB1A3, pSB1C3, pSB1T3, and pSB1K3.m1. These plasmid backbones have been prepared via PCR and purified. Prior to ligation the linearized backbones will need to be digested with with EcoRI, PstI and DpnI (DpnI is optional: to cut up original template DNA used to create linearized plasmid backbone), leaving two ends ready to be ligated to a BioBrick part. All 2017 submissions will need to be in pSB1C3, so we recommend using our pSB1C3 linearized backbone for that purpose. 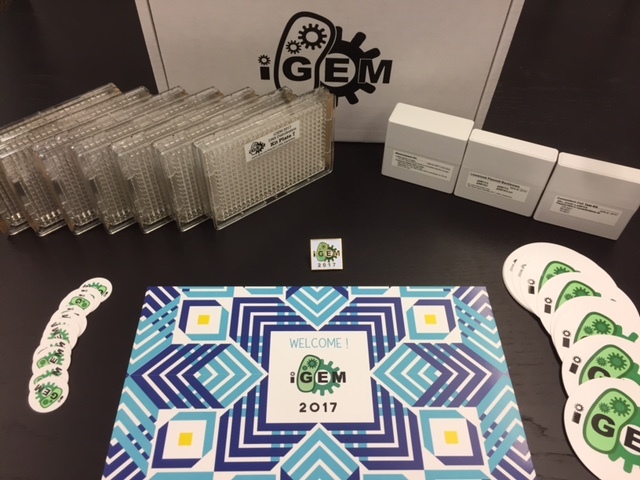 Over the past three years, iGEM has advanced the frontiers of science with the two biggest interlaboratory studies ever done in synthetic biology. These studies established a baseline for replicability of fluorescence measurements and identified likely key sources of error, and have now been published as an open-access journal article in PLOS ONE. To read the article, go to the following URL: http://dx.doi.org/10.1371/journal.pone.0150182. Please note, the InterLab activity is completely optional and is not required for any team. This Measurement Kit is for teams to use for both the InterLab study and for their own experiments. The kit includes 10 tubes (7 tubes of Fluorescein Sodium Salt, 3 tubes of LUDOX). Parts to be measured in the study are in the DNA Distribution Kit. See the InterLab Study page] for more in-depth instructions. 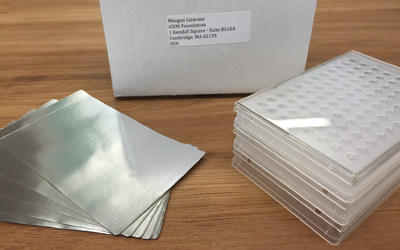 All part submissions must be shipped as dried DNA, in 96 well plate format, and covered with adhesive foil. We've provided a submission kit with all of the materials you'll need to ship your parts. See the Submission Kit page for more in-depth instructions. Before using the DNA plates, you should search the Registry for useful parts, which will also tell you if we have sample in stock, its location (if they're in your 2017 Distribution), requirements, quality control, etc. You can browse the contents of the 2017 Distribution in their entirety by visiting the Repository. Click on the 2017 Kit Plate of your choice, which will list all parts by their part name (BBa_..) in a plate along with their quality control information. Or you can click on the small part diagram below each Kit Plate link: "See a summary of the parts in this plate." Here at Registry, we want everyone to take a look at the results of the quality control measures we've taken this year and previous years, in order to make an informed decision when choosing to use a part. We've made sure to update the online repository for the Spring 2017 distribution with our quality control results.